According to the exhibition's internal logic, the young man in the photograph wearing little more than a smear of lip gloss and a 10-inch strap-on is a witness; the three life-sized figures made of wood and twine are participants. Viola Frey’s tall clay grandmother is active; the illustration of be-pearled basketball star Steph Curry is a witness (and a clever play on Vermeer's Girl with a Pearl Earring). In di Rosa Center for Contemporary Art’s newest guest-curated exhibition, Lexa Walsh assembles a "choreography of protest," in which she identifies some art objects as active, while others merely remark. Which, it might cause one to wonder, are you? Considering your own stance as participant or witness is one effect of the di Rosa’s ambitious yearlong two-part exhibition, Be Not Still: Living in Uncertain Times. Planned for last fall, Part 1 actually launched in late January, postponed due to the 2017 North Bay wildfires that damaged the late Rene di Rosa’s art-filled home, where bowling balls once shared the bath and dusty Bruce Nauman sculptures hung forgotten behind chairs. That central space is now closed to the public, allowing the two main galleries on the property to focus tightly on the good stuff they’ve got and the new work they commission. As a whole, Be Not Still responds to the America that began on Nov. 10, 2016. Part 1 showcased the reaction of artists Ala Ebtekar, Allison Smith and Rigo 23 to such topics as citizenship, American exceptionalism and white nationalism. It allowed writers Dodie Bellamy and Kevin Killian to curate works from Rene di Rosa’s personal collection to activate their own vision, one surprisingly informed by a Kylie Minogue lyric. 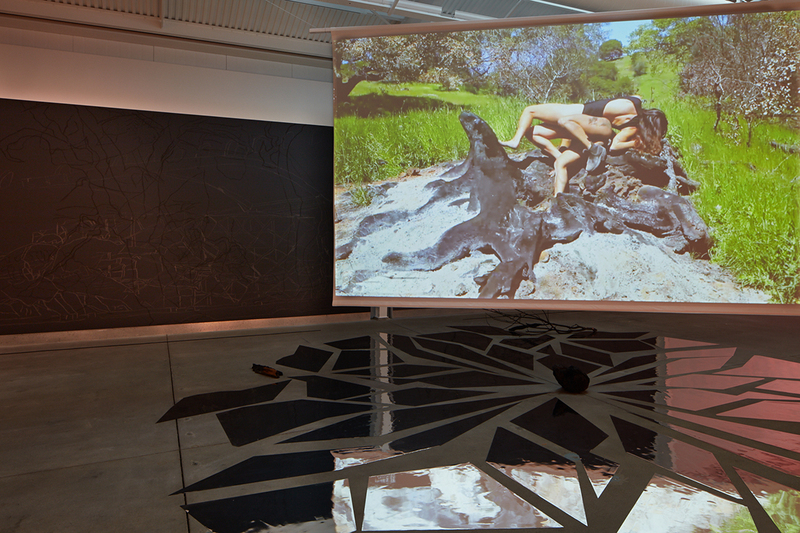 For Part 2, which opened June 23 and runs through Dec. 30, Walsh handles the curation in Gallery 1 and Bay Area artists Victor Cartagena, Ranu Mukherjee and Lava Thomas respond, respectively, to the topics of immigration, health and solidarity in site-specific installations that fill Gallery 2. 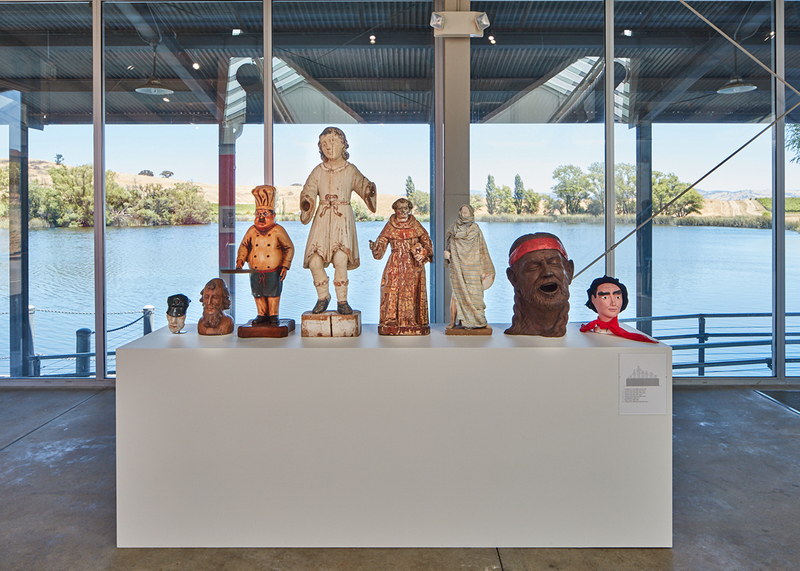 Walsh’s aggregation of 130 pieces of fine art, ephemera and found objects drawn from the di Rosa holdings, Rene’s personal kit of kitsch and Walsh's own collection (yes, that clown doll is hers) fill the first gallery, making the space lively even when you’re the only visitor there. 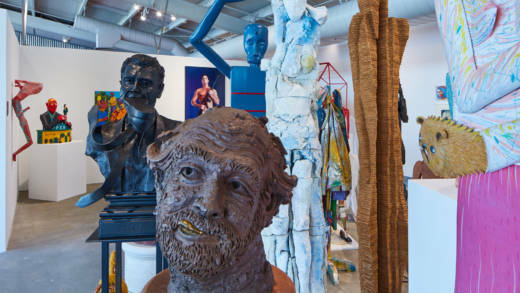 Walsh treats the paintings, sculptures, photographs and odd statuettes with a populist leveling that puts Robert Arneson’s leonine head on literally the same plane as a mass-produced steakhouse chef figurine and variously distressed saints. Groupings include David Ireland’s slump-filled chairs of Fix-It-All plaster set next to Ray Beldner’s Hidden Shame II, sewn from dollars and filled with dirt. Walsh painstakingly pored over some 4,000 thumbnail images from the Center’s permanent collection to assemble a funny, poetic, putrid, sad, phallic-positive, extremely human collection that manages to illuminate her own arc as a social practice artist while being extremely accessible to the ordinary visitor. Whether by design or not, she also pulls together a di Rosa greatest-hits parade, including work by Frey (for whom Walsh worked as a studio assistant, housecleaner and model in the early ’90s), the ceramicists and pun-makers Rene adored like Arneson, William T. Wiley, David Best, Robert Hudson and Richard Shaw, along with such classic Bay Area masters as Nathan Oliveira and Jay DeFeo. 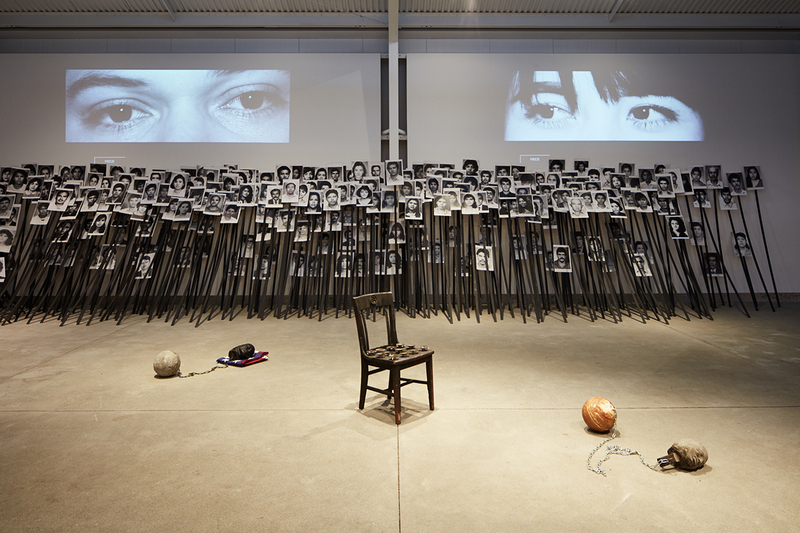 Faces—more witnesses—are the focus in Victor Cartagena’s Expulsion/Implosion, his immigration-focused installation in Gallery 2. Passport photos of citizens eager to move north from his native El Salvador enlarge to become protest signs mounted on sticks, leaning stacked against the gallery’s walls. In light of recent news about children detained separately from their families at the U.S.-Mexico border, Cartagena purposefully arranged the signs bearing children’s faces in a separate stack against a blank wall. In the room’s middle sits a miked chair that intones the numbers a bureaucrat might assign to an immigrant. On the floor, a ball of sugar connects via chains to a head made of cast cement, and a ball of concrete connects to head made of cast sugar. One of the heads sits neatly placed on a folded American flag. Video projections of anxiously blinking teens flicker on a back wall. Nearby, Ranu Mukherjee explores the global notion of health with an installation that responds directly to last autumn’s deadly fires in video, dance and drawing. Capturing artists from the Hope Mohr Dance Company interacting with dead trees, their bare legs becoming smudged with ash, the video Succession shows on a screen hanging in the middle of the gallery. The grey walls surrounding the screen bear charcoal-drawn images of other 2017 tragedies. Pieces of dead wood sit near mirrored vinyl shapes on the gallery’s floor. And finally, Lava Thomas celebrates solidarity by hanging some 600 pink and orange tambourines artfully from the ceiling, where they tinkle quietly, kept in constant motion by fans. Thomas says that she wanted to create something purely beautiful that would resonate beyond mere aesthetics. The tambourine is an instrument anyone can play, a sound used in both praise and protest. Quotes from female historical figures beginning in 1830 forward cover many of the instruments' faces. 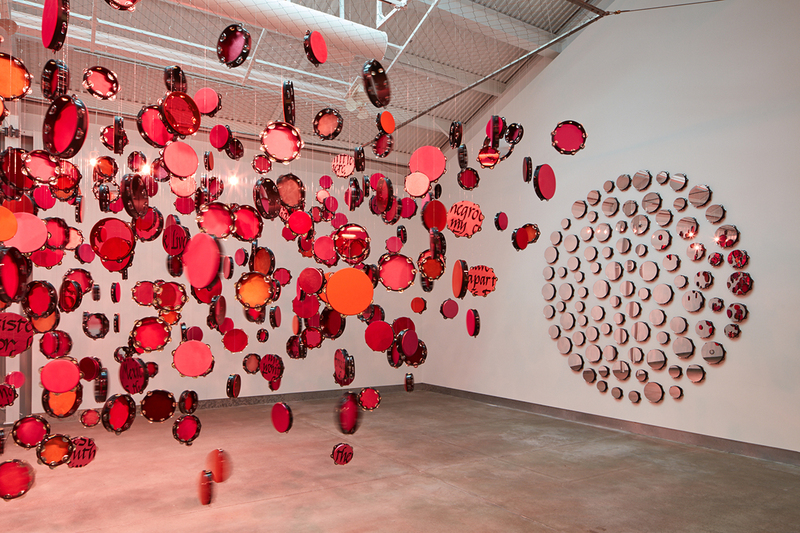 An additional 100 mirror-faced tambourines hang flat against the adjacent wall, allowing the viewer to see herself reflected in the piece (and incidentally providing a great spot for selfies). The three installations in Gallery 2 don’t require a tremendous amount of thought to engage with. They’re simple, straight forward and earnest. Sometimes earnest is a bad thing. But these aren’t some times—these are uncertain times and nuance is increasingly wasted. Earnest offers a clear point of view, a true desire to connect and a sincere expression of dire concern. ‘Be Not Still’ is on view at the di Rosa Center for Contemporary Art through Dec. 30, 2018, with an opening reception on June 30, 5-7pm. Details here.